^ Burgess and Hall, p.151. 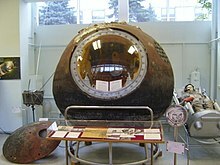 During a post-flight press conference on April 15, Alexander Nesmeyanov claimed that Gagarin took a sleeping pill. Also, Siddiqi, p.273, claims that they were both asleep at 21:30 when Korolev came to visit them, but Burgess and Hall, p.151, says Korolev spoke with them at this time. 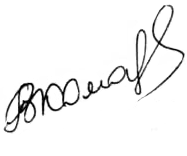 ^ Arthur Krock, "In The Nation; Concentration of Science on Outer Space," The New York Times p. 28, April 14, 1961. "But because of the distrust that now exists among the great nations, and has plunged them into huge programs of deadly rearmament, an achievement by one which carries a clear and direct potential of military supremacy engenders fear of its use.... And so it has become as impossible for either of the groups divided by the Cold War to welcome unreservedly such feats as Major Gagarin's in the opposite camp." ^ a b c d e f g h i j "Opinion of the Week: At Home and Abroad," The New York Times p. E11 (April 16, 1961). Quotes of reactions from many US and international sources. 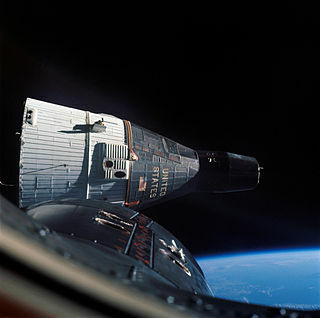 ^ a b c d "Man in Space", The New York Times p. E1 (April 16, 1961). 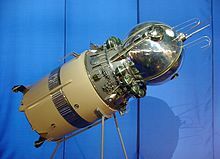 Vostok 3 was a spaceflight of the Soviet space program intended to determine the ability of the human body to function in conditions of weightlessness and test the endurance of the Vostok 3KA spacecraft over longer flights. 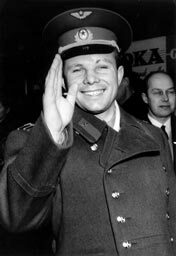 Cosmonaut Andriyan Nikolayev orbited the Earth 64 times over nearly four days in space, August 11–15, 1962, a feat which would not be matched by NASA until the Gemini program (1965–1966). Globus IMP instruments were spacecraft navigation instruments used in Soviet and Russian manned spacecraft. The IMP acronym stems from the Russian expression Indicator of position in flight, but the instrument is informally referred to as the Globus. It displays the nadir of the spacecraft on a rotating terrestrial globe. 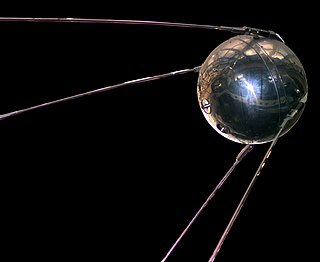 It functions as an onboard, autonomous indicator of the spacecraft's location relative to Earth coordinates. An electro-mechanical device in the tradition of complex post-World War II clocks such as master clocks, the Globus IMP instrument incorporates hundreds of mechanical components common to horology. This instrument is a mechanical computer for navigation akin to the Norden bombsight. It mechanically computes complex functions and displays its output through mechanical displacements of the globe and other indicator components. It also modulates electric signals from other instruments.